Cheap to fabricate and capable of being applied to practically any surface, or material, of nearly any form, shape or size, scientists and researching are looking to a new generation of solar photovoltaic (PV) cells and modules made from a class of minerals known as perovskites that some believe has the potential to make solar power generation much cheaper and ubiquitous. Photovoltaic research teams around the world are making significant advances – at the fastest pace in industry history – that are paving the way towards commercialization of perovskite solar cells and modules that can be sprayed on to surfaces for portable, wearable and small-scale applications – clothes and accessories, consumer electronics devices, vehicle and building windows, etc. They’re also “printing” sheets of thin-film perovskite PV cells and modules roll-to-roll, which can then be glued or otherwise adhered to just about any surface, or substrate. As a result, they’re suitable for larger scale applications – roof tiles, walls, vehicle bodies and entire buildings. In addition, PV research teams from academia and industry are experimenting and testing specific varieties of perovskite PV cells and modules encased in glass and assembled into the rigid-frame PV panels now familiar worldwide. They are also using them to boost the efficiency of crystalline silicon and thin-film PV modules commonly used today. 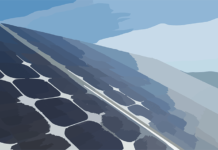 A collaboration between solar energy industry, research institutes and universities in Belgium, Germany and the Netherlands, Solliance is at the forefront of perovskite PV research and development. Solar Magazine recently spoke with Ronn Andriessen to gain a better understanding of perovskite PV and recent R&D advances, as well as a better grasp of prospects and applications going forward. Scientific R&D teams around the world have been able to realize huge gains in the energy conversion efficiency of perovskite PV cells and modules – the fastest in industry history. Solliance on Nov. 21 announced it had achieved world-record energy conversion efficiency of 13.5% at the cell level and 12.2% at module-level aperture for a perovskite PV cell using common industrial roll-to-roll (R2R) production processes. This latest achievement comes in the wake of a previous world record Solliance set earlier in 2017. Solliance was able to achieve the new record high for perovskite PV energy conversion efficiency by building upon a pioneering demonstration of roll-to-roll perovskite PV cell and module production it made in March. 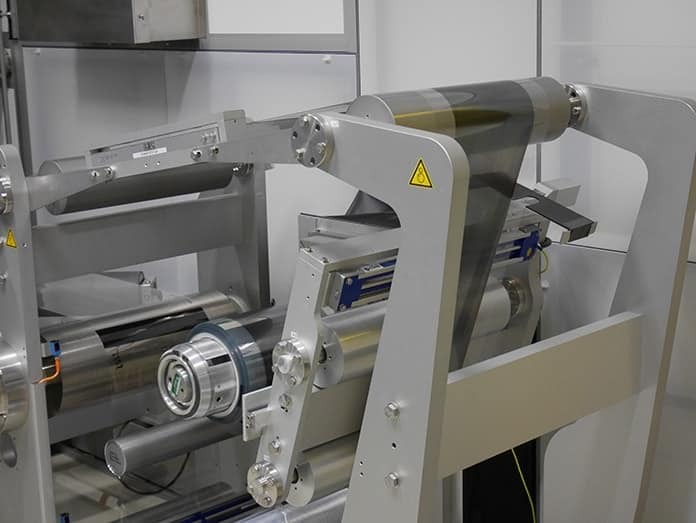 In setting the new world record, the R&D team further optimized and again validated its dual-track roll-to-roll coating line, Solliance explains in a news release. Opaque and semi-transparent varieties of flexible thin-film modules for which perovskite PV cells are deposited on to the surfaces of flexible substrates as opposed to the glass used in producing rigid form factors. Solliance envisions, and is working to apply, these form factors in a variety of applications. Its opaque, or non-transparent thin-film perovskite PV modules are produced by depositing electricity-producing, micron-scale perovskite PV cells on to metal foil. These can be readily mounted, glued or otherwise adhered to walls and building facades, Andriessen explained. 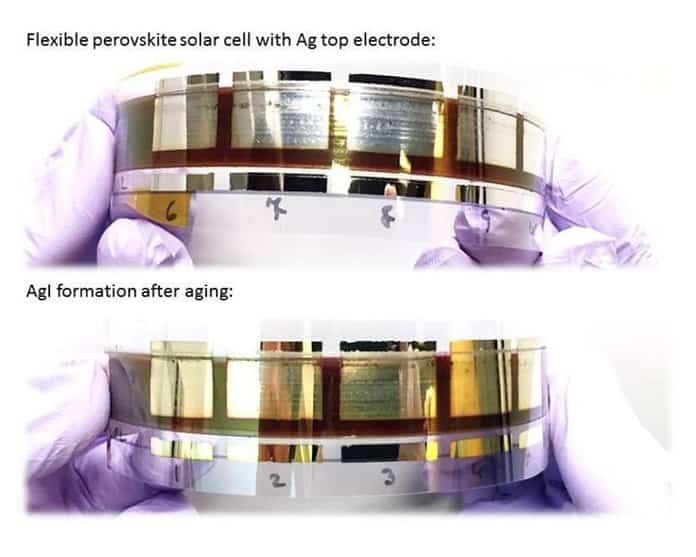 A translucent gray in tone, the rigid or flexible, semi-transparent perovskite PV cells Solliance is producing are ideal for office and building windows, Andriessen said. In order for sunlight to pass through them, Solliance at high resolution removes 50 percent of the PV module stack from a rigid or flexible, opaque glass perovskite PV cell. “We wind up with 50 percent module efficiency. 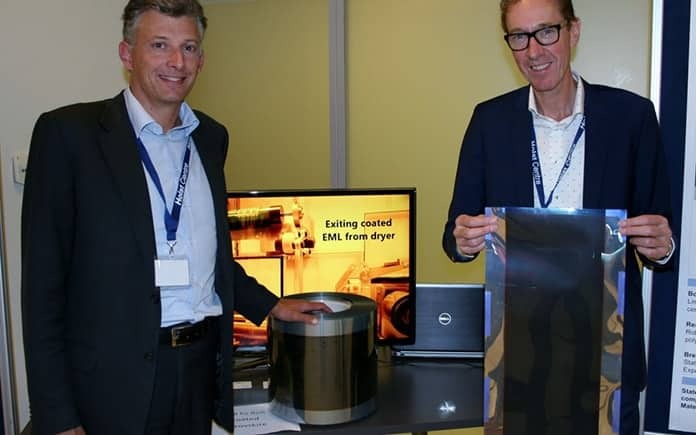 At Solliance, we are producing them in maximum dimensions of 30×30 centimeters, but this could be up-scaled to produce rigid or flexible modules with dimensions of 60×120 centimeters typical for commercial thin-film PV modules or much larger if desired for an envisaged application,” Andriessen pointed out. By using two transparent electrodes perovskite PV modules can be layered on top of a crystalline silicon PV module, or panel. 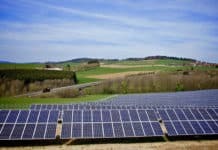 Energy conversion efficiency gains of anywhere from two to six percent, depending on the silicon PV technology used, can be gained as a result, Andriessen said. Along the same line as Solliance, University of Tokyo Professor Hiroshi Segawais leading a five-year PV industry-university R&D project funded by the Japanese government to develop industrial strength, commercial perovskite PV cells and modules. Industry participants include the likes of Fujifilm Corp. and Panasonic. “This is the front-runner of low-cost solar cell technologies,” Segawa was quoted in a recent Bloomberg Business news report. No less than the World Economic Forum singled out perovskite PV production as one of the top 10 emerging technologies of 2016, Bloomberg’s Chisaki Watanabe noted. PV R&D teams across Asia, Europe and the US are racing to make breakthroughs, pumping out as many as 1,500 research papers a year on the topic, Watanabe added. Manufacturing the crystalline silicon PV cells and modules is an expensive, multi-step process conducted in clean room vacuum chambers at temperatures above 1,000 degrees Centigrade. Perovskite PV cells and modules, in contrast, can be produced using simple, wet chemistry methods and techniques. Micron-sized perovskite PV crystals are designed with any of a variety of specific chemical compositions with specific properties, fabricated in labs and mixed into a solution that can be deposited on a wide variety of substrates. Researchers have fabricated perovskite PV cells made from two commonly used types of chemical compounds – methylammonium and formamidinium lead trihalides – using various solvent and vapor deposition techniques. Both can be scaled up to industrial levels relatively easily, Len Calderone explained in an April 2017 article for AltEnergyMag. Solar energy researcher and Solliance partner scientist Bert Conings explains in a TEDxUHasselt presentation, perovskite PV researchers are aiming to boost perovskite PV power/energy conversion efficiency further by stacking cells that can produce electrical charge from the entire frequency spectrum of sunlight. That’s just what a Stanford University R&D team led by professor of materials science and engineering Reinhold Dauskardt achieved just recently. Finding inspiration in the compound eyes of a common fly, the Stanford research team used standard industrial lithographic manufacturing techniques to create a compound perovskite PV cell in a honeycomb structure. Each PV cell is encapsulated in a hexagon-shaped scaffold that measures only 0.02 inches (500 microns) in width. “We make hundreds of individual cells in each device, but this is simply determined by the lab scale processing we conduct. With scale-up tens or hundreds of thousands of cells could be made for each device,” Dauskardt told Solar Magazine. The Stanford R&D team created perovskite PV honeycomb modules that were rectangular in shape, but they could easily produce them in any shape or form, Dauskardt said. “We are certainly interested in developing cells on curved surfaces, since there would be many applications for these in designs including solar cells,” he added. The rapid succession of new record-high energy conversion effiencies is perhaps perovskite PV researchers’ most impressive achievement to date, says Tyler Ogden, Next Gen power analyst for Lux Research. That being said it is far from clear that perovskites will come to follow through and be commercialized as thin-films have. As of now, perovskites still suffer in terms of durability and length of life compared to incumbent technologies. Early versions of thin-film CIGS (cobalt-indium-gallium-selenide) cells and modules suffered from rapid degradation, on the order of hours. PV researchers were able to overcome those faults and make a big contribution towards paving the way for CIGS to be applied widely. Advances in perovskite PV seem to be moving along a similar path, Ogden pointed out. “Increasingly both labs and start-ups are demonstrating longer lifetime with limited degradation. Some start-ups (GreatCell and Oxford PV) are also claiming they are now able to pass the same accelerated aging IEC tests that thin-films meet,” Ogden said in an email response to questions. Solliance has been working to develop the first industrial-strength manufacturing processes for a variety of perovskite PV cells and modules across a range of envisioned applications since shifting its focus away from organic PV R&D in 2014. “The organic PV program did not gain sufficient traction among our industry partners, so we stepped over to perovskite R&D. We started late, but I think we have caught up,” Andriessen said. Solliance sees greater, and more immediate, promise in the application of perovskite PV cells and modules in areas where “silicon PV can’t go,” Andriessen continued. “If you’re thinking of replacing silicon PV, you can forget it. “Perovskites are not going to bring about universal photovoltaics, and in this respect, they are only latching on to the same failed promise organic photovoltaics espoused in the early 2010s,” Ogden said. 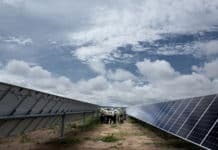 Furthermore, commercial-scale energy conversion efficiencies are likely to remain too low to adequately power consumer devices, and that’s an application area that thin-film and organic PV are already meeting. The same hurdle exists when it comes to integrated applications, from clothing and accessories to cars and buildings, he added.